Irish Christmas ornament features the Claddagh along with crystal construction. The Claddagh motif on this ornament is enhanced with the words, friendship, loyalty and love, the sentiment of the Irish icon. This Irish ornament features a Claddagh that is enhanced with Celtic knot-work. 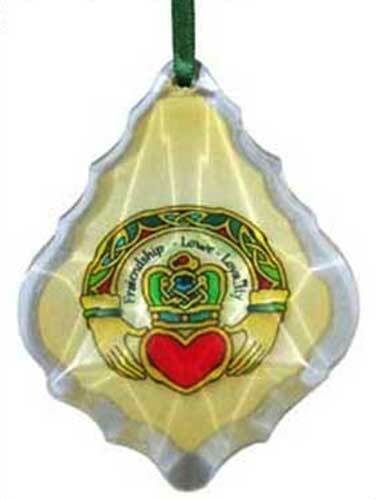 The Claddagh Christmas ornament is a dimensional crystal design that is enhanced with scalloped edges; it measures 2" wide x 4 1/2" tall. The Irish Christmas ornament is ready to hang on your tree with the included green ribbon; it is gift boxed with Claddagh and Celtic knot history cards, complements of The Irish Gift House. The Claddagh ornament is made in Ireland by Clara. Irish crystal ornament features a shamrock sprig. Irish Christmas ornament features a Celtic enhanced shamrock along with crystal construction.